Hana Ceramic Flat irons are by far the best flat irons around. Made of 100% pure ceramic, they are available at an affordable price even for non-celebrities. Most ceramic flat irons plates are usually made of aluminium and coated with ceramic which doesn’t make them the real “ceramic flat irons.” The Hana straightening plates, however are made of 100% reinforced tourmaline ceramic with no external coating, are smoother, more durable, and superior at heat distribution and retention. Furthermore they don’t peel and are scratch-resistant too. Even heat distribution of the ceramic plates ensures that it’s gentle on your hair with no exposure to damaging hot metal, whatsoever. And the black ceramic plates never discolor, no matter what hair product you use or how often you iron. The damp to dry styling feature of this flat iron is also great. Tourmaline generates intense negative ions to condition damaged hair follicles for healthy frizz-free shine that lasts. There’s no sizzle when you use it on your damp hair – just glide it smoothly through your hair and your hair is straight. The Hana is portable and also comes with a handy Luxe Heat Proof Storage Pouch for travelling and a heat-proof portable rubber mat to set it down when it’s still hot and a special edition tin case. It’s easy to hold, light and the cord swivels around easily to avoid tangling. And it’s energy efficient at a maximum wattage of 38W.I was able to straighten my full head in less then 30 minutes without having to go over it twice again! It definitely left my hair smooth, non-frizzy and with a shine I've never seen before. I only just found out that I could curl my hair with a flat iron! Nice post. I'm gonna buy it soon. Thanks for all the great information. I always wondered about some of that. I'm curious about your thoughts on hair straighteners. When using the iron on your hair comb, on the section you are using first, before running the iron through it. Try avoiding using any products until you finish straightening out your hair. Use a wide bristle brush on your hair while brushing your desired shape into place. I can't wait to get my hands on a Hana flat iron!!! 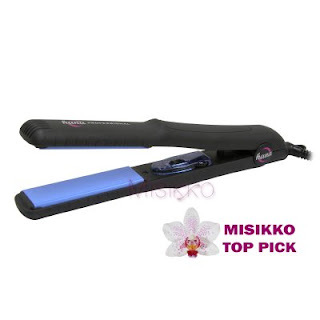 If Misikko is chosing Hana flat iron as the top pick then I am absolutely +++ that this is the best iron for anybody. It is very interesting for me to read that blog. Thank you for it. I like such topics and everything that is connected to them. I definitely want to read a bit more soon. It is very interesting for me to read the post. Thanks the author for it. I like such topics and anything connected to them. BTW, try to add some images :). Hi does Hana have dual voltage for international use? Nope, you have to use a voltage converter.